To commemorate the 20th anniversary, Madaras is creating a series of 20 intriguing paintings called The Spirit Animals that will build on her philanthropy. The Spirit Animals are striking watercolor images that all have several elements in common, including a tattoo. She is also continuing her series of saguaros painted in the style of several “old masters,” and will reveal her latest work entitled “Saguaro Van Gogh” at the gallery’s All Artist Show on Sunday, March 10th, 2019. A portion of the proceeds from these paintings will benefit Art for Animals. 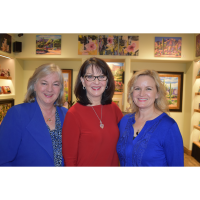 Madaras Gallery was founded in 1999 after Diana Madaras left her job in sports marketing to pursue her passion for painting. Madaras’ work explores a wide variety of subjects from the vibrant Sonoran Desert, to soulful animal portraits, to expressionistic florals. She paints in watercolor and acrylic and is best known as a colorist. The gallery has grown to include the work of 26 guest artists, and has become one of Tucson’s most popular destinations. Madaras has been voted “Tucson’s Best Visual Artist” nine times, and the Gallery was voted “Best in Tucson” in an Arizona Daily Star reader’s poll in 2017. Madaras has been honored by numerous organizations for her philanthropy, including the Arthritis Foundation of Southern Arizona, New Beginnings for Women and the Tucson Rotary Club. She was awarded the prestigious Copper Cactus Award for Outstanding Community Service in 2009. In March 2019, she will be honored by Tucson Wildlife Center. Madaras Gallery is located at 3035 N. Swan Road, Tucson, Arizona. Artwork and information about gallery events may be found at madaras.com. For hi-res jpgs, please contact kiley@madaras.com. To contact Diana Madaras, please email diana@madaras.com.